We’re Moving… but first I’m going to GA! Long story short, we are packing up and heading back to our old house in the city. We still have some unfinished renovations at our country house and it’s nearly impossible to get things done with a 3 year old and 15 month old. Soooo, we are moving back so we (my husband and contractors) can complete the renovations. I’m kinda excited… I’ll have neighbors again and a backyard that is fenced in for the boys but we will be leaving 4 acres on the water! 🙁 We will be back but I am ready to see people again! lol Seriously, if I wasn’t able to interact with you on the blog and share my recipes, I would have gone crazy long ago! 🙂 Also, the boys and I are leaving Tuesday morning heading to Georgia for my sister’s wedding. It’s going to be a long trip with 2 kiddos but luckily my niece is flying in tonight to help! I’ll be excited to see family and excited to see my sister tie the knot with a wonderful man. I’ll also be making her wedding cake, a 3-layer cheesecake! I am sure I will be making other stuff but I actually hope that I will get a little break from cooking and let everyone else have a turn… at least they have my recipes! This will be the first trip going home where most of my immediate family eats how I eat. This makes me happy! My sister and future brother-in-law gave up grains last October and combined they have lost 70 pounds, my sister’s cholesterol came down 25 points and my brother-in-law no longer has leg pains after 20+ years of daily discomforts! Oh, and my mom has lost tons of weight too! I’m pretty proud of them and they will be sharing their full testimonies on my blog very soon! Since I will be out of state for a week, I will be a little slower to answer emails and questions. Thanks in advance for your patience! Dairy-Free: Omit the cream cheese and add equal amounts of coconut cream (the cream that rises to the top of the coconut milk in a can). I used THIS brand of coconut milk. I confess, the dairy-free version doesn’t taste like cheesecake but more of a coconut-blueberry dessert. Individual Servings: Use a muffin tin and liners to create mini cheesecakes. Press 1-1/2 tbsp. of crust into the bottoms of your cup cake liners and bake for 10-12 minutes. After cooled, use a 3 tbsp. or 4 tbsp. scoop to divide the cheesecake batter between the cups. Change the Fruit: I bet this would be delicious with fresh cherries, raspberries or even peaches! Don’t have a spring-form pan?? : No worries, simply use an 8 inch cake pan, pie plate or square pan. You can also make Blueberry Cheesecake Squares using a 9X13 inch pan. However, I would double the crust recipe. This is a thick cheesecake so you won’t need to double the filling. I hope you enjoy and Happy Fourth of July! *Approximately2 cups of blueberries blended in a blender. Preheat oven to 350 degrees F. In a medium bowl, blend almond flour, pecans, salt and stevia. Stir in melted butter. Taste for sweetness and saltiness and adjust if needed. Press into the bottom of an 8-inch spring-form pan. Bake for 20 minutes or until crust is slightly brown but not burned. 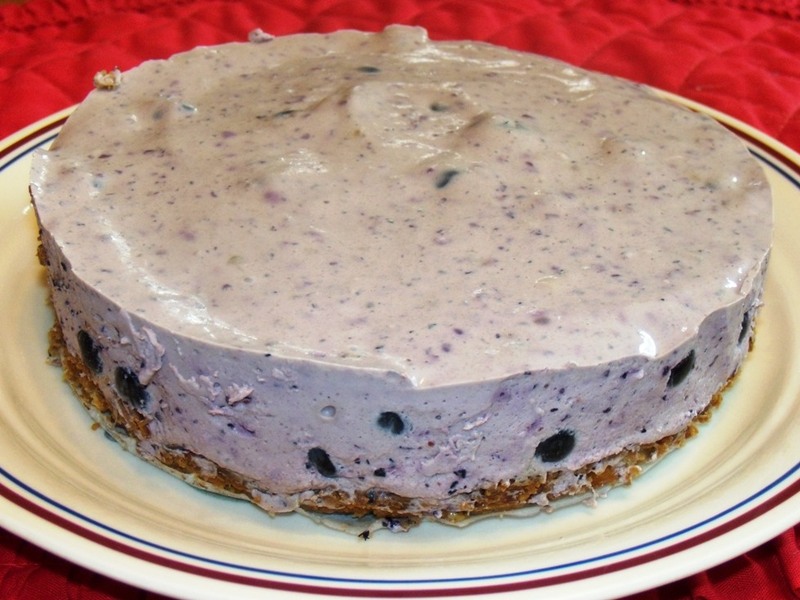 While crust is cooking, prepare the Blueberry Cheesecake Filling. In a large bowl add the cream cheese and sweetener. Blend with hand mixer until soft and creamy. Sprinkle the gelatin over the hot water in a small bowl. Stir the gelatin until dissolved. Pour the gelatin mixture and blueberry puree into the cream cheese mixture. Blend well with mixer being sure to scrape down the sides. Taste for sweetness and adjust if needed. Stir in whole blueberries. Once crust is partially cooled, pour the cheesecake filling over the crust. Refrigerate for 4 hours or overnight. To serve: Gently slide a knife around the edge of the cheesecake pan, releasing the edges of the cheesecake. Serve cold alone or with Blueberry Compote. Have fun! It’s great to have family eating the same way! My husband (and kids) eat this way and my mom is trying but it would be nice to have some more family members on board. I am so excited to make this this week! I have fresh blueberries too. My daughter’s almost fiancée is coming Friday to meet the family and spend the weekend. This looks like dessert ! Thanks for the recipe! It Did! Thanks for such a awesome recipe!!! melissa, i read your inspiring story and yesterday made the ranch dip and the cheese biscuits…both awesome! could you tell me if you ate fruits (including dry such as dates and raisins, which is more paleo) or not….which is more low carb, while losing weight? i have a little low blood sugar so all really low carb is a bit difficult. no grain is great though, and feeling really good after three days no grain. today i am going for the cheesecake fudge..with Lily’s stevia sweetened dark chocolate chips. thank you for your wonderful blog. 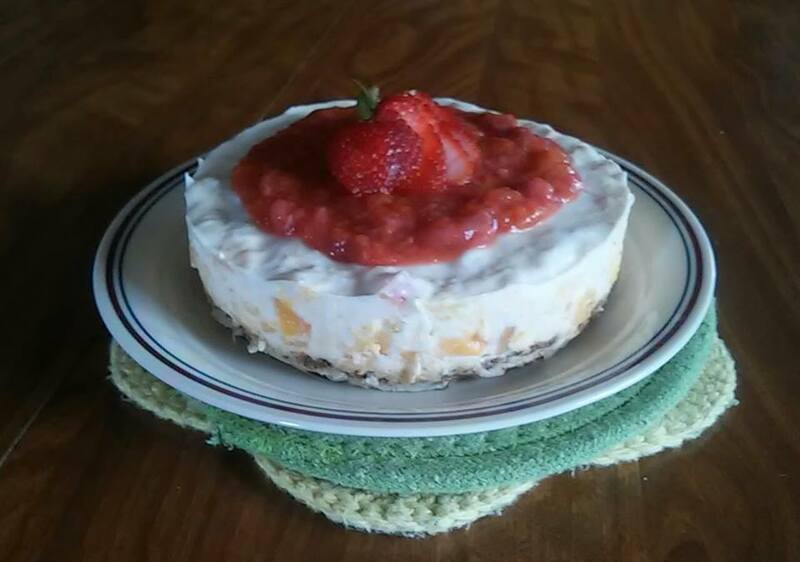 This cheesecake is so easy to make and tastes heavenly! I made 1/2 the recipe using sunflower seeds instead of almond flour and pecans and used a 6-inch springform pan – just the right size for 3 people to enjoy for a couple of meals! I think a dollop of whipping cream and a strawberry on top would make for a festive dessert treat for the Fourth of July. I just made this desert for my family. It was very, very easy. I didn’t have pecans, so I substituted with a variety of other nuts and it worked well. I used Trivia for the sweetner too. I made the blueberry compote to drizzel on top. All was delicious!!!!! Thank you!! Glad you enjoyed it Dawn!! So…I was making another double batch of Peachy Tea this morning (I do add about a tsp of cinnamon to the simmering peaches) and had an idea… I made a pretzel crust and the filling for the blueberry cheesecake, but instead of blueberries, I added the peach pulp from the tea and some chopped peaches. I had left over peach pulp so I added a few chopped strawberries and made a compote (using the Blueberry recipe minus the vanilla). Here’s the final product (and it’s very yummy)! Yes, this is another 6″ cheesecake using 1/2 recipe. I took this to a BBQ at a friend’s house and everyone loved it! I put grated lemon zest on the top before serving which was a delicious combo with the blueberry. And that crust is amazing, I will definitely be using that crust for other desserts too. Since I didn’t have a springform pan I made it in a tart pan with removable bottom. I was worried the fluted edges might make it difficult to release from the pan, but it came out easily! I just whipped this up for a dinner party we are having tomorrow. I used an 8×8 pan, as I don’t have a spring form pan. It fits perfectly and is now firming up in the fridge. Such an easy recipe, and I can see how versatile it can be. I LOVE that you list all the possible variations for this right at the top! I always have those kinds of questions like, “Well I use a different sweetener…should I change the amount?” or, “I kinda just want smaller portions, what about using x?” So it’s awesome that’s all right out there. The recipe looks great in general! I’m excited to try it out! This looks great. Can’t wait to try it. Also, when reading your substitutions part at the top for those who are dairy free – I’ve found that cashews with a little lemon can make a pretty great substitute for cheesecake. If you google hail mary lemon tart, you’ll get the idea. Works wonderfully! REALLY LOVE YOUR COLLECTION OF RECIPES, BUT i HAVEN’T BEEN GETTING YOUR NEW RECIPES/NEWSLETTER IN A LONG TOME, WOULD LOVE TO GET YOUR NEW RECIPES & INFO!.